כאן תגלה את האתרים הקדושים בישראל, שבהם מיליוני עולים לרגל בכל שנה משלימים, מבקרים ואוהבים את סיפור הישועה: מהגליל הירוק למדבר הנגב, מהים התיכון לנהר הירדן. The charming village of Ein Karem, situated on the western slopes of Jerusalem, is a popular destination for both pilgrims and locals alike, with its churches and monasteries, romantic cafes and restaurants, and green hills perfect for hiking. The Hagia Maria Sion or Dormition Abbey is the Catholic sanctuary in Jerusalem that commemorates the taking up of the Virgin Mary into heaven at the end of her earthly life, also known by the Orthodox Churches as the Dormition (falling asleep) of the Theotokos. The Old City of Jaffa, located on the southern edge of Tel Aviv on the Mediterranean coast, was known in ancient times as the gateway to the Land of Israel. With its 3,000 years of history, Old Jaffa is the world’s most ancient port. 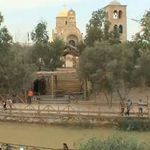 Tradition identifies the deserted place where John the Baptist grew up as the hermitage of St. John in the Desert, also known as 'Ain el-Habis (spring of the hermit.) The site is located in the heart of the Judean hills, about 3 km from Ein Karem, St. John’s birthplace, which is itself just 7-8 km west of Jerusalem. On October 27, the Franciscan Friars of the Custody of the Holy Land head out to the Jordan Valley, accompanied by hundreds of pilgrims and local Christians, for their annual pilgrimage to Jesus’ baptismal site on the Jordan River.